A unique image produced using only a camera, with its stunning simplicity of the horse “Walter” standing behind the rider. Visually the two merge into one and ooze of surrealism. One has to try really hard to stop thinking it’s real. Although the concept has now been plagiarised by many, this is the actual source, the original. Size approx. 20 x 24inch, numbered and signed original. Each original is officially embossed and comes with a certificate of provenance. 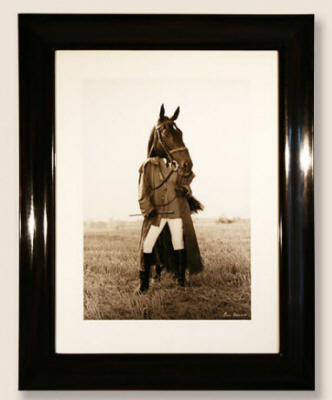 Frames are hand made to order, please allow 21 days if order is framed.__ 14 days unframed.